Rabbi Abba Hillel Silver was incredibly productive. Imagine, being active in the community, scholarly writing, frequent lectures out of town, maintaining an active correspondence with so many, and being a leader in Zionist activities at the national and international level - all while leading a congregation with more than 2,000 member families. He was The Temple's only rabbi until 1927 when Rabbi Leon Feuer became his assistant. These were days when travel was by rail and mail meant handwritten or typed letters. Each weekend, even at the peak of his Zionist activity in the early 1940s, he would return to Cleveland to be with his family and his congregation. His weekly sermons were not from notes; they were fully typewritten, ready to publish. He took his work very seriously and so too did The Temple, for they gave him ample secretarial support and retained what he wrote and what was written about him. It was as if they all knew that the day would come when scholars would want to use these papers for research. The original home of the archives was at The Temple - Tifereth Israel in University Circle, where it was available to scholars. In the early 1990s the Western Reserve Historical Society was asked to assist by organizing the papers and microfilming them. Financial support for the undertaking came from The Temple and the Jewish Community Federation. The huge collection of materials came over to the WRHS around 1992. The Silver Papers project personnel were three archivists: Tracy Backer, Deborah Shell and Jeffrey Zdanowicz, and a microfilm technician Bernard Watford. They improved the organization of the materials, microfilmed the archives, and developed a finding aid (179 pages, dated 1994). As a consequence of Silver's energy and creativity and his synagogue's respect for his sermons, scholarly articles, civic activities, correspondence and clippings, the Abba Hillel Silver Archives are huge. As we are told below, to organize them took 5,779 file folders and to capture them 235 reels of microfilm. A brief program on Sunday, November 13, 1994 (see CJN story below) celebrated the completion of the archiving and microfilming. Raphael Silver spoke on behalf of the family. The Silver papers remained housed at the WRHS. Later in the 1990s, with the encouragement of the Silver family who believed that his papers would be better preserved and more available to scholars at the WRHS, the WRHS became their permanent custodian. An unpublicized but noteworthy recent development at the Western Reserve Historical Society has been the online publication of the finding aids (detailed inventories) for many of their archives. Abba Hillel Silver Papers MS 4787 94.20 lineal feet. 135 containers Finding Aid processed in 1994 by Deborah Shell, Tracy Backer, and Jeffrey Zdanowicz. Microfilmed in 1994 by Bernard Watford and Michael McCormick. Processing and microfilming of this collection was made possible through funding provided by The Temple-Tifereth Israel. Abba Hillel Silver Papers, Series II, MS 4842, 1.71 lineal feet. Finding Aid created in 2001 by Jane Avner. pur·loin (pr-loin, pûrloin) v.tr. To steal, often in a violation of trust. It's a shocking story, told to show the importance of professional conservation, and also to inform researchers who plan to use the Silver Archives. In 1967-1968, when the archives were stored at The Temple, Noah Orion, who had just come to Cleveland to teach in a Jewish day school, began to use them for his doctoral research. He was given frequent - and we must assume also unsupervised - access to the original documents. In 2005, years after the Silver Archives had moved to the WRHS and had been processed and microfilmed, the WRHS received two boxes of documents. It seems that when Noah Orion found documents related to his topic, he didn't ask for them to be copied. He put them in his briefcase and took them home! He then returned to Israel, taking the purloined papers with him. He wrote notes in ink on some documents and finished his dissertation 14 years later, in 1982. He continued to keep these precious papers from others, stored in a damp location, and waited another 23 years to return them. An example of the breadth of the archives is Rabbi Abba Hillel Silver's eulogy for Rev. 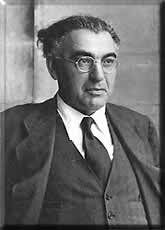 Zvi Hirsch Masliansky. On April 15, 1943 he gave the eulogy for Masliansky, the great American maggid whose speeches in Yiddish had been his boyhood oratorical inspiration. It was in the auditorium of the Educational Alliance in New York's Lower East Side - the same place where in 1906, Masliansky, then 50, America's greatest Yiddish orator, had spoken and 13-year-old "Abe" Silver had listened so intently. Now 50-years old, perhaps America's greatest Jewish orator, Abba Hillel Silver spoke. A 13-year old boy, Marshall Weinberg, a grandson of Masliansky, was there. To prepare, Silver had written four pages of notes in his Commodore Hotel room, on hotel stationery. He must have brought the notes back to The Temple in Cleveland that weekend and given them to his secretary who filed them. In 2010 I was working on a web project with Marshall Weinberg. He remembered the eulogy and asked if it was available. I forwarded his request to Dr. Sean Martin at the Jewish Archives at the WRHS. Yes, it was in the archives. Soon a copy was on its way to Mr. Weinberg. 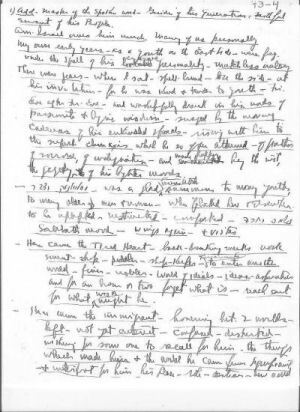 The first page of Abba Hillel Silver's handwritten notes for his eulogy of his mentor Rev Zvi Hirsh Masliansky. To see all the pages of the eulogy full size, with a transcription, click here. Curator for the Jewish Archives at the Western Reserve Historical Society. These institutions have the microfilms of the Abba Hillel Silver papers. They should also have the finding aid for the collection, which researchers will want to consult first. Ben Gurion Research Institute, Sede Boqer Campus. This list may not be complete. Reference librarians should be able to find the papers on WorldCat [www.worldcat.org], the international catalog for academic libraries. WorldCat is available for researchers using public libraries as well, like the Cleveland Public Library. 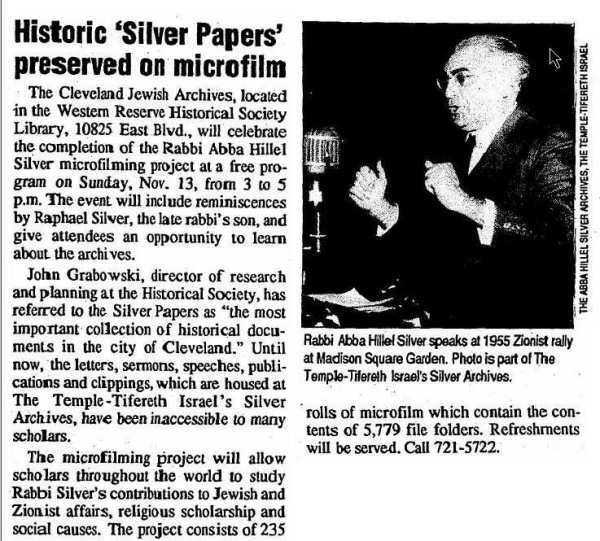 A researcher should go to a good public library or an academic library and ask to locate the catalog entry for the Abba Hillel Silver Papers from WRHS in WorldCat, and then request the finding aid through interlibrary loan, and then request the microfilm through interlibrary loan. As of late 2013 all of the WRHS archive finding aids (detailed archive descriptions) were on line at OhioLINK. For the Finding Aid collection, click here.